We eat lots of dip. With a retiree in the house my winter lunchtime fallback position is a bowl of soup with bread or crackers. I find it easy to make healthy soups with a wide variety of flavours and textures, but providing a nourishing healthy spread for the bread is another issue. I have already posted “mock turkey” and “potted steak,” rustic Australian ideas from my childhood, but I also make a variety of dips with vegetables and legumes. 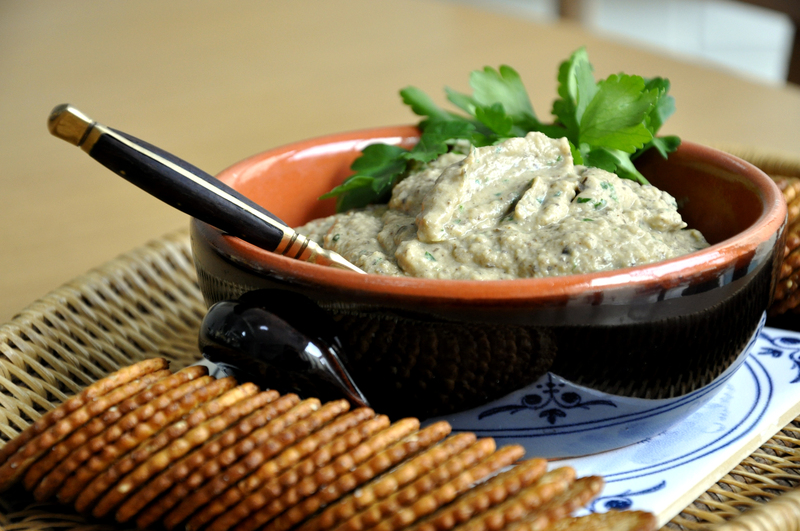 Today we had middle eastern style garlicky eggplant dip. ½ cup olive oil, approx. Wash the eggplant and prick the skin all over with the tip of a knife. Roast the eggplant in a moderate oven for approximately 1 hour until it is soft. Slash the eggplant open, put it in a colander and with the back of a spoon squeeze as much liquid out as you can. Put the peeled and chopped cloves of garlic in the processor, add the drained eggplant, whizz to puree. With the processor motor running, drizzle in enough olive oil to create a light cream. Stir in the chopped parsley and salt and pepper to taste. Makes approx 2 cups of dip. This entry was posted on June 26, 2012 by ladyredspecs in Dips and Spreads, FODMAP diet, Food, Gluten Free, Light Savoury Dishes, Side Dishes & Salads and tagged baba ghanoush, dip, eggplant puree, garlic.